API’s Private Detective have been conducting on ground investigations in Thailand since 2001. At first we tried local private investigators and we could never get the result required. To conduct investigations in Thailand you must have a person who is honest, speaks and writes both Thai and English to overcome the red tape if you are chasing documentation or talking to authorities. API has achieved this and there are many operatives working for us when necessary. API are lucky to have an associate in Chiang Mai, a retired Australian Federal Policeman who speaks fluent Thai and his wife of 18 years a Thai National, who is fluent in speaking and writing English and Thai. Our associate is also a Thai Tourist Policeman of five years standing. He understands the legal system and has helped many foreign tourists who have got themselves in trouble with the law. The majority of API private detective in Thailand are to find missing persons. In saying that the subject of inquiry are mainly male persons who have holidayed somewhere in Thailand and met a Thai lady. The next thing that happens they fall in love and assets are transferred from their original home country before the wife finds out. They decamp to live in Thailand. This is a common occurrence. You then have army personal who have not been able to adjust to life after serving in Afghanistan and Iraqi, and just want to escape from life. API’s experience through on ground investigations travelling through many outback areas of Thailand, you come across Caucasian men living in little remote villages and wonder what they are running away from. The success rate of our private detectives in Thailand is eighty five percent. In one particular case in 2002 an offender murdered his brother in law in a Perth suburb and disappeared to Indonesia ending up in Thailand. The last Perth Police heard of his whereabouts was in 2004 at a Bangkok bar in Soi Seven called the “Winking Frog”. 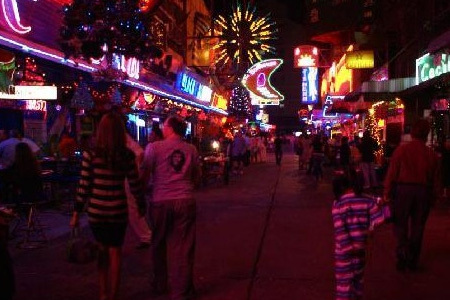 In January 2009 two of API’s investigators door knocked and handed out wanted brochures in the area in Bangkok, and were able to establish the offender was seen in the area living with a prostitute around Christmas 2008. This information was given to Perth Detectives and they rejuvenate their inquiry with Thai authorities. The offender was apprehended in August 2010 for a breach of immigration laws and was extradited to Perth. He is now awaiting trial on a charge of wilful murder. API were not involved in the arrest of this man but the information that he was seen in Thailand 2008 assisted police in alerting the Thai Authorities he was there.